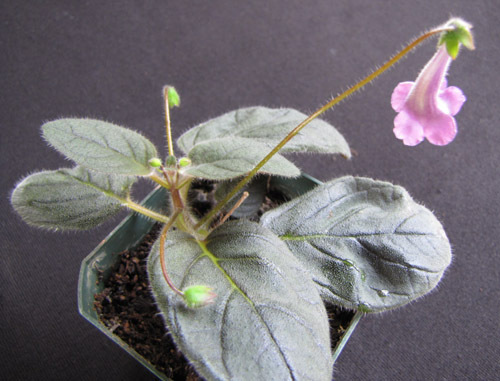 Wu Jui-Jung of Taiwan crossed Sinningia aghensis with S. pusilla 'White Sprite'. Dale Martens gave me a tuber, and this flower is what I got. The plant is larger than S. pusilla but much smaller than S. aghensis -- it is about the size of a standard miniature. The flower is funnel-form like that of S. pusilla and not campanulate like that of S. aghensis. The flower is intermediate in size between that of the two parents. The darker purple color near the throat of the corolla and the markings within the throat probably derive from S. aghensis. Also note that the flower has no spur at the base. S. pusilla, as can be seen in the picture on the left on this page, has a distinct spur, but this trait was not inherited, and is presumably recessive. Flowers are borne on stalks originating in the axils of the leaves, like those of a standard miniature. There is no tall peduncle like that of S. aghensis, but the pedicel is very long for the size of the plant, no doubt a heritage of its aghensis ancestor. For scale, the pot is 3 inches (7.5 cm) across. It is unlikely that the choice of the white-flowered form ('White Sprite') of S. pusilla had much effect on the external appearance of the hybrid. It could come into play if the hybrid proves to be fertile (I have not obtained seed so far), as some of the progeny could reflect the white-flowered influence. The hybrid has peduncles. Here is the first peduncle on my plant with more than one flower [April 2010]. 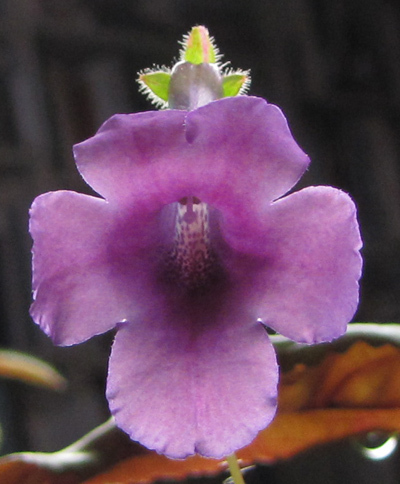 The hybridizer has named this cross Sinningia 'Jung's Violet Dew'. Peduncles from the next axil had three buds each. Here is one of them [April 2010]. 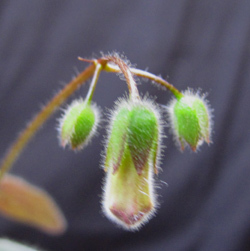 Note that this is a regular cyme, with one central bud and two lateral ones, not the pair-flowered cyme that is more typical of sinningias and gesneriads (which would have, in addition, a fourth bud directly below the central one). It may be that the plant will make a pair flower on its peduncles when it gets older. 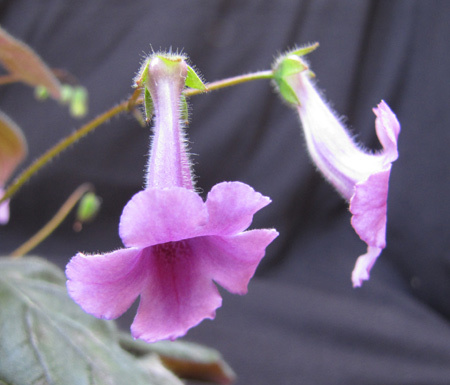 Dale Martens observed that the hybrid flower had two enlarged pouches at the base of the corolla, something not present in the S. pusilla seed parent. This picture shows where those pouches came from. 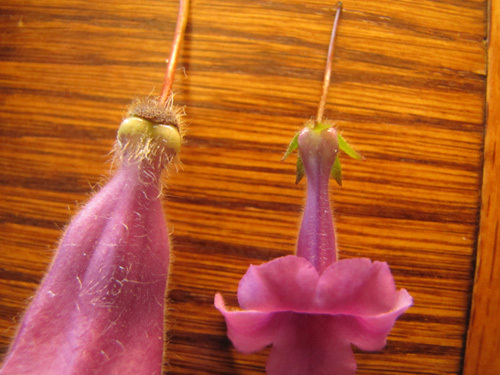 On the left is the flower of S. aghensis, while the other flower is the hybrid. The calyx lobes were removed from the S. aghensis flower, to show the base of the corolla. The two yellow bulbs, which remind me of insect eyes, are presumably chambers to hold nectar, awaiting a visit from a pollinator. 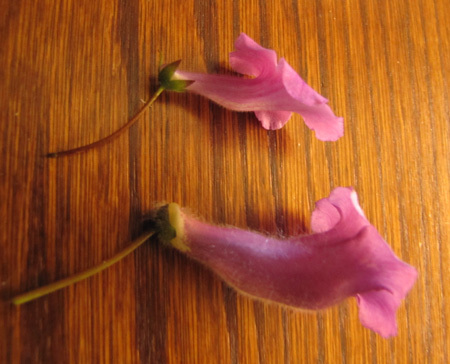 The picture also shows that flower shape is quite different, but the sizes are not. The flower of S. aghensis is campanulate, while that of the hybrid is funnel-form, with a much narrower corolla (inherited from S. pusilla. Considering that the height of the S. aghensis peduncle which furnished the top flower was 45 cm [18 inches], while the flowerstalk length of the hybrid was 9 cm and the height of the entire plant was 11 cm, it is rather surprising that the hybrid corolla lengths is 2/3 that of the species. The floral tubes, with S. aghensis on the bottom and the hybrid on top. 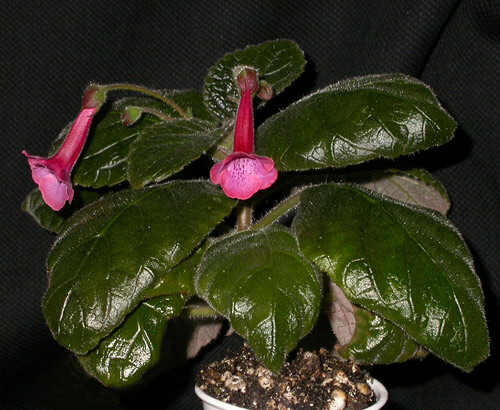 This plant is Dale Martens's cross of S. 'Jung's Violet Dew' with S. bullata. In her estimation, this plant is too much like other S. bullata crosses to name. A few other crosses have been done with S. aghensis, referenced on the Corytholoma crossing page. Leaves Dark green tops, reddish backs. Dormancy It has a tuber, midway in size between those of its parents. Flower Purple, funnel-form, with purple-dotted yellow stripe in throat. Taxonomic group Both parents are members of the aghensis group of the Corytholoma clade.